Whether your child is a toddler looking for one more glass of water, an elementary-age child scared of having bad dreams or a preteen begging for “Just ten more minutes” before lights out, if you are a parent, you know that bedtime can be a struggle. It’s one of life’s truisms: as an adult, a good night of sleep is precious, but for kids, bedtime is just another unfair burden laid upon them by grownups. Still, sleep is essential for good health, so if you’ve started to dread the approach of nightfall and subsequent bedtime battles with your child, here are nine tips to make your child’s trip to the Land of Nod just a little bit easier. Whether young or old, everyone benefits from a regular nighttime routine. Not only does it provide a way to unwind at the end of the day, but it lets the brain know that sleep is coming, triggering associated sleepiness. For the best effect, a bedtime routine should take 30 minutes to an hour, involve only relaxing activities and end in bed. If your child is very young, you’ll carry out the routine with her, but older children can usually handle most of it themselves. In today’s wireless world, many kids spend several hours every day interacting with electronics. This is especially true with the preteen and older set. Unfortunately, one of the most common factors keeping kids awake at night is time spent looking at a glowing screen within an hour or two of bedtime. The light produced by computer, phone or tablet screens is enough to interfere with the brain’s production of melatonin, the hormone that regulates the sleep cycle. If you want your children to fall asleep faster and sleep better, you’ll need to enforce a strict “no electronics” policy for at least one hour before bed. The dark is a scary place for many kids. Monsters under the bed, bad guys breaking into the house, the boogeyman lurking in the closet… as children develop active imaginations, it’s very common for nighttime fear to be a side effect. Fear of the dark usually peaks between ages two and six, but can linger on for many kids (and even some adults.) You might not eliminate the fear entirely, but you can help your child handle the fear until it’s naturally outgrown. Let your child sleep with a stuffed toy or other lovey, and remind him that the toy is there to keep him company and keep him safe. Never belittle your child for his fear, but do perform a quick, matter-of-fact “monster check” at bedtime. Although a dark room is best for sleep, a nightlight can really help many kids who fear the dark. Let your child pick out a fun nightlight, and plug it in across the room from the bed. Rearrange your child’s room so that the bed is in a corner. This cuts down on open space monsters might use to reach up and grab your child. Pets can be disruptive to sleep, but a very fearful child is likely to find comfort from having Fido or Mittens nearby, preferably in a pet bed of their own. Serve your toddler a highly sugary snack before bed, or let your preteen help himself to a couple more slices of pizza before hitting the hay, and you’ll likely have a child who can’t fall asleep on your hands. An overly full stomach is a common cause of sleep difficulties, particularly if that stomach is full of sugar or fat. On the other hand, a hungry child won’t sleep well either. The solution is a light bedtime snack that combines a small helping of protein along with carbs. Ideal choices include a bowl of non-sugary cereal and milk, a slice of turkey wrapped around a celery stick, a nibble of cheese on crackers or a small helping of yogurt. Additionally, make sure your child isn’t drinking anything caffeinated within several hours of bedtime. Although infants should have nothing in their cribs that poses a suffocation hazard, many toddlers and older children derive great comfort from a bed partner. For most children, that partner comes in the form of a beloved stuffed animal. For others, it’s a well-loved and worn blanket or pillow. Still other children have more unusual choices – a toy train, a book or a favorite action figure. Having a nighttime friend helps kids relax and feel safe. Whatever object your child chooses, let her outgrow the need for this companion naturally. One key to a good night of sleep is a consistent bedtime. 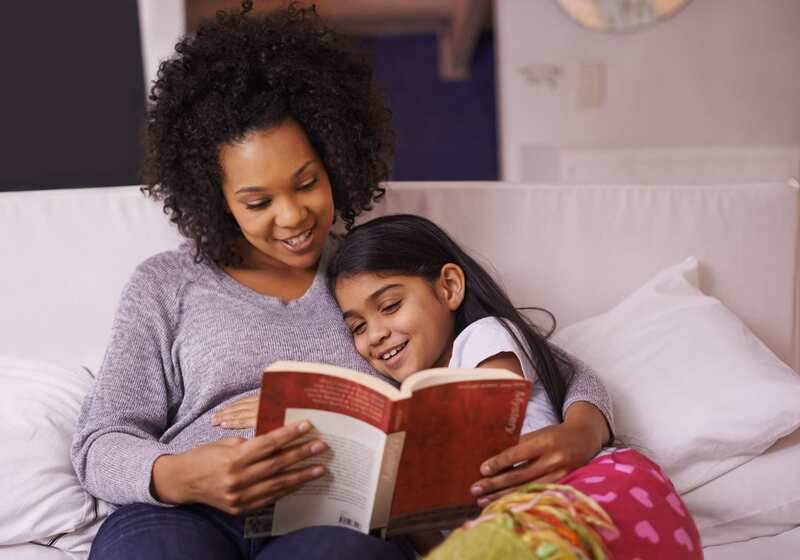 Don’t let your child decide when she wants to go to bed – that decision is up to you, and it is up to you to enforce it. According to the CDC, preschool-age children need at least 11 to 12 hours of sleep each day, elementary-school-age children need at least ten hours per day and teens should be sleeping nine or ten hours each night. Since most kids need to be up by a certain time in order to get ready for school or daycare, it’s easy to figure out an appropriate bedtime: just count back from the morning alarm. Do your best to stick with this routine, even on the weekends and holidays. Your reward will be a child who falls asleep more easily. Just like adults, kids sleep best in a dark, quiet room that is somewhat cool – generally between 65 and 70 degrees at night. If it’s your child’s bedroom conditions that are keeping him awake, take the necessary steps to correct the situation. It may take little more than a white-noise machine, a bedside fan or humidifier and heavier drapes to help your child sleep better. They might not worry about paying the bills or work problems, but that doesn’t mean children’s lives are trouble-free. If your child is tense or anxious at night, help him unwind enough for sleep by teaching him some easy relaxation techniques. Bedtime prayer is an effective way to calm the mind, especially when it focuses on gratitude. Even a young child can use the most simple meditation technique –paying attention to each breath in and out, while silently counting or thinking of a word or phrase. Older kids may benefit from guided meditation. There are many apps and downloads available with guided meditations specifically geared towards children. Most guide the listener through relaxing the body by releasing muscle tension. Others help the listener relax by picturing a scenic retreat, such as a beach, mountain or meadow. A few easy yoga poses before sleep is another way to help your child relax. If your child occasionally needs a little extra help in falling or staying asleep, there are many natural remedies to try. One of the best is aromatherapy, the use of inhaled essential plant oils to induce health and mood benefits. Try a few drops of lavender essential oil on your child’s pillow, or a fragrant lavender room mist. Herb tea is another possibility – there are several herbs that taste good and induce sleep. Try chamomile, hops, California poppy or passionflower tea. Have your child drink a cup of tea an hour or so before bedtime. If necessary, sweeten with a bit of honey.